Pagani Assembly Line. 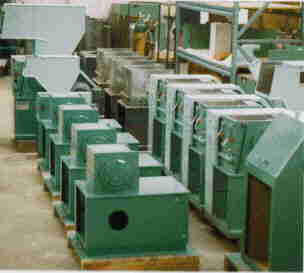 All granulators manufactured under the Pagani name are carefully assembled from the highest quality steel stock and parts. Pagani can handle any customer order requirements. Their manufacturing plant is capable of producing numerous granulator machines per month in a quality contolled environment. Solid metal flywheel being milled and finished product. Adding solid flywheels rather than die cast flywheels to every Pagani granulator assures the maximum output of each machine as well as the maxium attention to operator safety. Solid flywheels perform better than die cast equivalents. 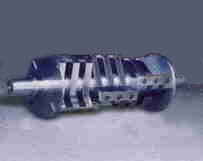 Hog Rotor Cutting Knife Configuration. This knive configuration photograph belies the enormity of the hog rotor. Each knive shown is more than seven inches long and yet, when assembled in the granulator, can cut a piece of paper. Staggered Rotor Cutting Knife Configuration. Staggered rotor configurations are ideal for reducing film and sheet plastic into granules. Shown here is a typical Pagani staggered rotor configuration. 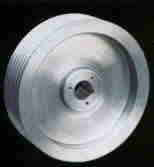 As with the hog rotor photograph this rotor's photograph belies its massive size. Cutting Chamber. 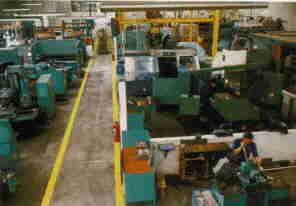 This is a photograph of an actual Pagani cutting chamber opened for maintenance and inspection. Notice the careful attention to mil spec tolerances. 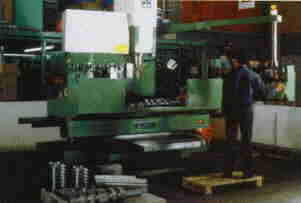 Stamping Machine. Part of what makes Pagani granulators so rugged is the quality of the equipment used to manufacture each part going into the final assembly. 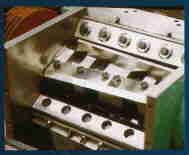 Shown here is a typical stamping machine (one of many) used to manufacture cutting chambers. Staggered Rotor Cutting Chamber Diagram. 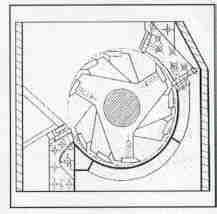 Shown here is an actual engineering drawing of the inside dimensions of a staggered rotor cutting chamber. Notice the close tolerances which are capable of slicing a piece of paper. Pagani Customer Service Offices. Pagani's officers and customer service functions are state of the art. So, too, its computerized support system. E-mail can be sent back and forth between D and K Enterprises, its customers, Pagani and their customers detailing virtually anything including engineering drawings of custom configurations prior to their actual manufacture and delivery to the customer.